Toll fraud is the fraudulent use of a telephone system by unauthorized entities to make telephone calls at your expense. Australian telecommunications security experts predict that breaches are occurring daily in Australia resulting in millions of dollars in damage. Most breaches in Australia are unreported, but the press have reported several cases in Australia that have involved litigation. 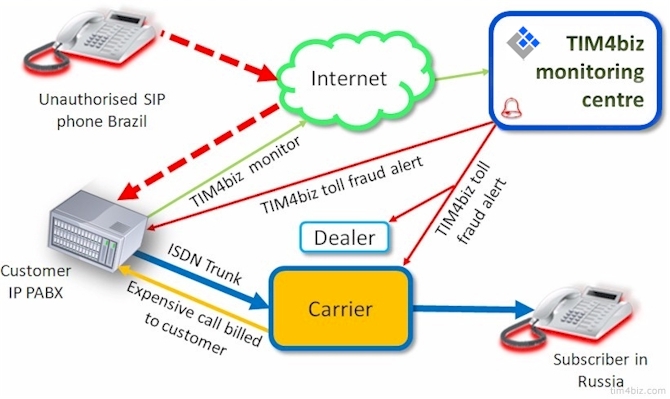 TIM4biz monitors call traffic on your telephone system and alerts you via email or SMS of unusual activity. Once access to a telephone system is achieved calls to expensive long distance and premium numbers can be made and access to your telephone system can be traded, posted on the internet or sold to third parties in the form of cheap telephone calling cards. The first a business usually knows of calls being made on their telephone system is when the monthly telephone bill arrives. How can TIM Technologies help you? TIM Technologies call accounting monitors your telephone system for lengthy, numerous incoming and outgoing calls, expensive outgoing calls and calls to destinations such as international and premium numbers and alerts you via email or SMS as the calls occur enabling you to be proactive in maintaining your telephone system and halting toll fraud when it first occurs instead of when you receive your telephone bill with thousands of dollars of fraudulent calls. Preventing illegal access to a telephone system in the first place is the primary defense against toll fraud. But security holes can appear in even a correctly configured system as changes are made, for example as telephone lines are added or extensions are moved. And not all toll fraud or system misuse occurs outside a business as employees make unauthorized, numerous or lengthy calls or unsupervised night staff such as cleaners make calls. There are three components of cybercrime; knowledge, opportunity and motivation. The knowledge to gain illegal access to a telephone system is freely available on the internet - it is the same knowledge used to access and operate a telephone system in the usual day-to-day operation of a business. The opportunity to gain control of a telephone system comes in the form of a poorly secured system. Default system passwords, an incorrectly or poorly configured or maintained system all contribute to allow third-parties to take control of a system. The motivation to hack a telephone system is predominantly monetary - making cheap phone calls or profiting from selling access to your system to third parties.